Review: It's been five years since Echospace man Stephen Hitchell donned the Phase90 alias for "Infinitati", a suitably dark and dubbed-out debut album that remains one of his most mesmerizing releases. All these years on, he's decided to rework three of the album's most potent tracks under one of his other aliases, Intrusion. The heart of the EP is undoubtedly his A-side "Possession Dub" of "Vinci", a quiet, contemplative and effortless spacey dub techno revision that bubbles away for almost 16 minutes. 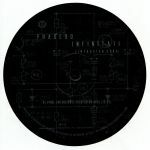 He switches focus on the B-side opening "Remake" of "Infinitati", re-imagining the track as a cloudy and slowly pulsing ambient soundscape, before offering up a "Metamorphose" revision of "Ango" that's as deep and ambient as dub techno gets.